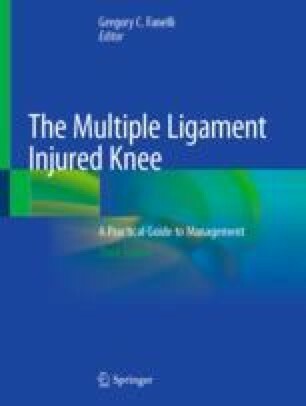 Patients with instability after multiple-ligament-injured knee (MLIK) often present with many concomitant pathologies, including limb malalignment, meniscal incompetence and cartilage defects. Surgical treatment remains challenging; yet, interest has recently increased with numerous anatomic studies and technical notes published about ligament reconstructions, ligament augmentations, and ligament repairs in and around the knee. However, biological healing of soft tissues can be uncertain and inefficient to control forces and torques applied to the joint. In this context, axis impairment creating mechanical disorders need to be recognized, analyzed and corrected. Associated or not with soft tissue procedures, osteotomy is a surgical option that is a part of the knee surgeon’s modern armamentarium. This chapter highlights the role of osteotomy to restore stability and function in MLIK as a means of ensuring success in the long-term outcome.